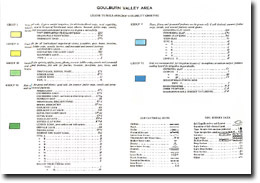 The 'Soils and Land Use in Part of the Goulburn Valley, Victoria' report was published by the Department of Agriculture in 1962 by J.K.M. Skene and T.J. Poutsma. This survey comprised the Rodney, Tongala-Stanhope, North Shepparton and South Shepparton Irrigation Areas. It is a detailed soil survey of some 223 000 hectares and was completed by a team of Department of Agriculture soil surveyors. Soil maps derived from this report can be downloaded by clicking on to the appropriate sheet numbers on the map below. A downloadable version of the report (without the maps) is also available below.